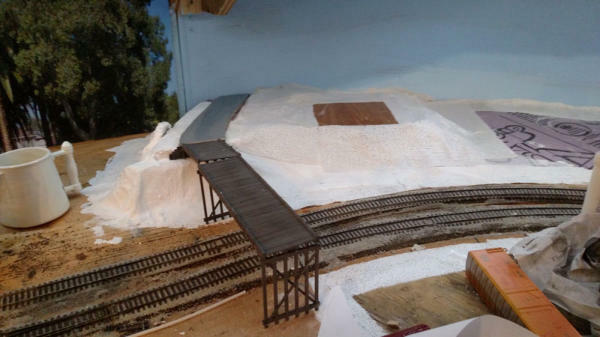 I decided that this winter I wanted to finish the San Luis Obispo section of the layout. The starting point was to build a small hill that would mark the end of the yard tracks. The hill also serves as a place to put a small, wooden overpass that is similar to one that actually existed in the ‘50s (and earlier). The hill also helps hide the end of the backdrop behind San Luis Obispo. The start of the hill was some pink foam board and plaster gauze. 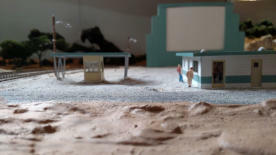 Then a roadbed, a flat spot for a future house, and more gauze. The third picture shows some grass and bushes have been added to the top of the hill as well as some trees to further hide the end of the backdrop. 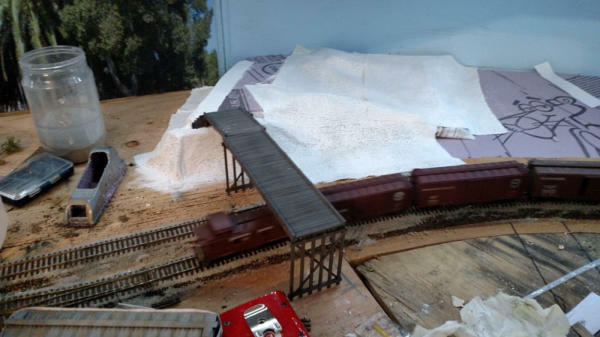 The correspond hill on the near side of the tracks will not be done until all the work on the far side of the tracks is complete. Project 2 was the area on the other side of the tracks from where I wanted to put a Drive-In Theater. I decided to add a house and some trees as well as other landscaping. 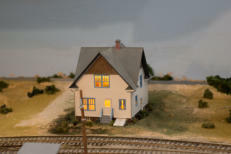 A review of Coast Line Pictorial showed me some houses that were along the tracks in San Luis Obispo. I chose an Atlas kit as it seemed to look at least a little bit like one shown in the book. Here is the scene after it was finished. I made the trees to the right of the house, added just a short section of street and then the grass and bushes. The kit is a well designed kit that goes together very well. Since this house is in the background I didn’t do a lot of detailing. I painted interior and exterior, added some curtains, two lights, a couple of walls so you can’t see all the way through, and upstairs there is a woman watching the movie while she changes the sheets on a bed. 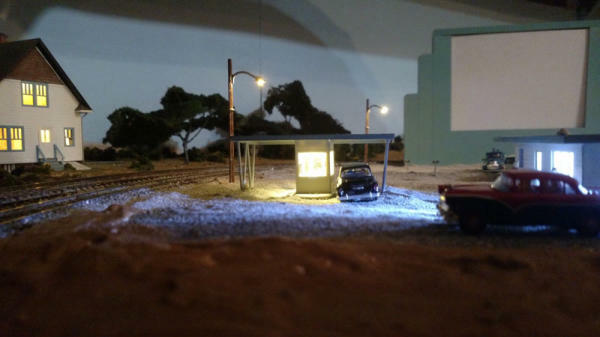 The third project for the year was adding a Drive-In Theater to the layout. It is placed on the outskirts of San Luis Obispo. I don’t believe this is the correct location for a drive-in in San Luis Obispo but I wanted a drive-in and I had the space here, so that is where it ended up. The Drive-In is made from a Walthers Kit and is designed to hold a 7” tablet so you can have working movies. 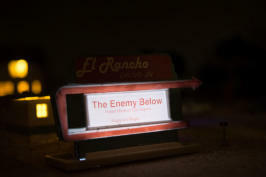 I named the El Rancho because my family used to go to the El Rancho in San Jose. It wasn’t near the tracks either. Here are some pictures of the work and then a video. 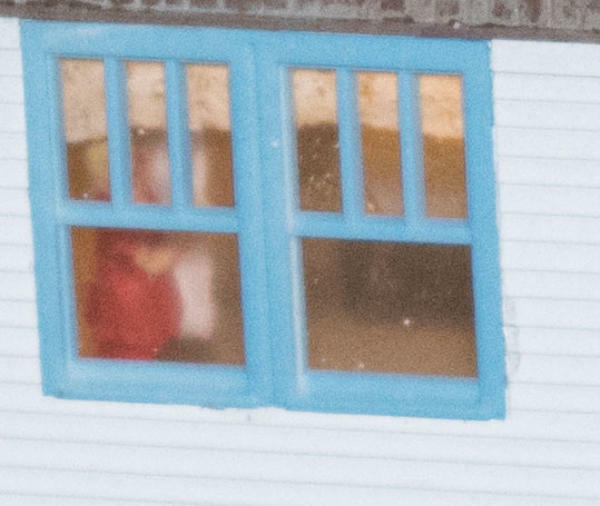 As usual, clicking on a picture will allow you to enlarge it. 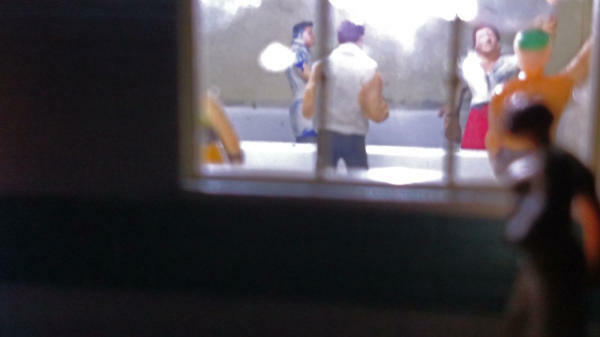 This a shot of the interior of the snack bar as modified. Walthers provided most of the interior walls. 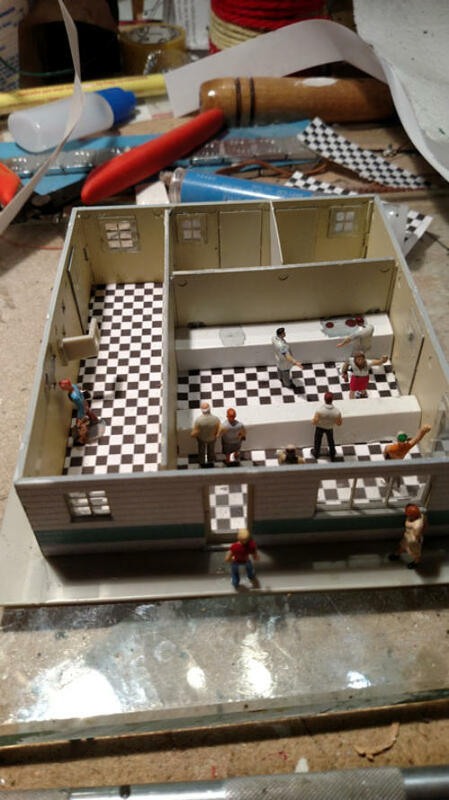 I added the wall separating the bathrooms, flooring, counter, cooking area, people, and lights. The bathrooms and the light from the projector booth. Views of Drive-In as it sits on the layout. The sign was a fun sub-project within the overall project. I first scanned the signs provided in the kit, then re-lettered the name of the theater and created my own collection of movie titles (from 1957 movies of course) which are printed on clear transparency sheets. The final part was illuminating the sign. 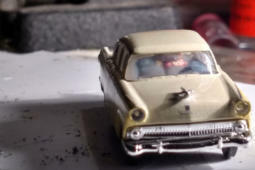 I first tried putting small LEDs inside but the light wasn’t spread out evenly. Then I found that Miller Engineering sells a thin illuminating sheet which I was able to cut to fit into the sign. Project four. The depot area of San Luis Obispo. Note on railroad terminology. To a railroad a station is a place. It may or may not have any building. 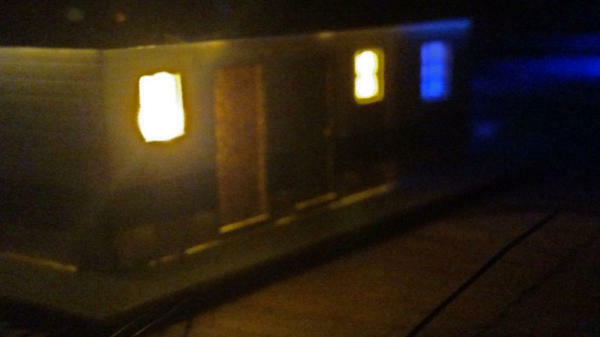 A depot is a building where passengers and/or freight get on and off the train, or what most people call the station. 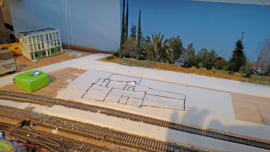 When finished, the San Luis Obispo depot area will have 4 main buildings and several smaller ones. 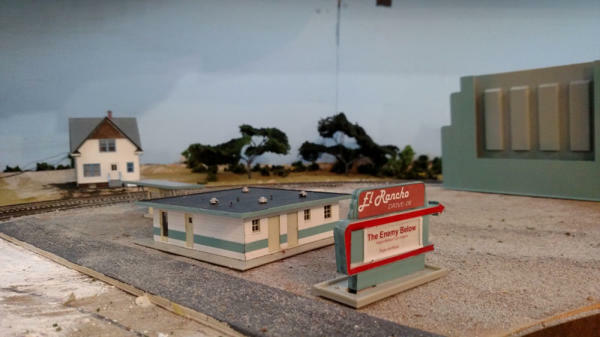 There will be the passenger depot which I built in Minnesota. It needs a few repairs and some paint touch up and it will be ready to go. Likewise, the Park Hotel. 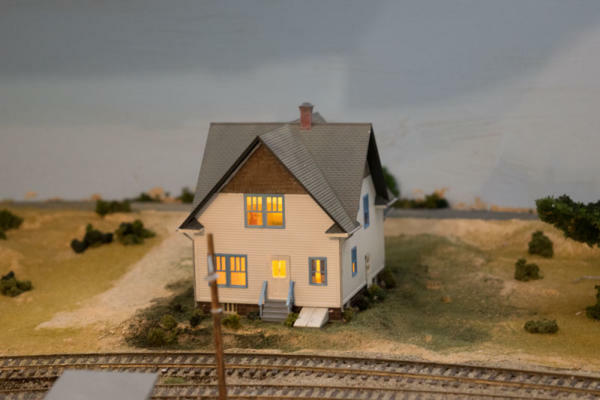 New will be the former passenger depot, which after 1943 when the new depot was built, was used as an office and a house that was owned by the SP and housed a family that worked in the depot. The starting point. 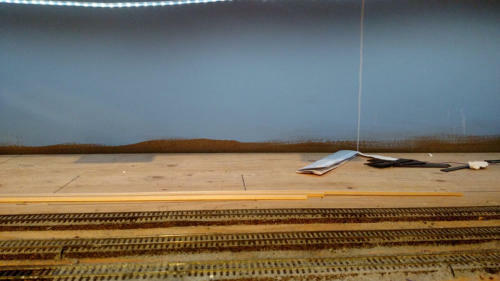 Some empty plywood with a few tracks. 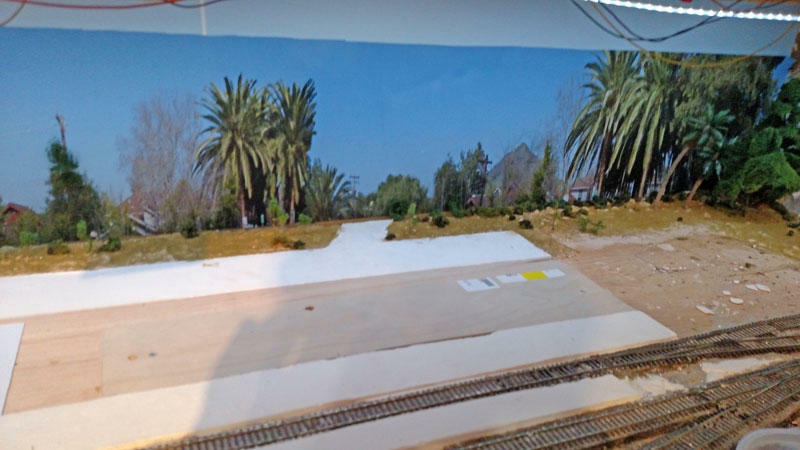 Now with a photo backdrop added as well as some streets that go behind the depot, cross streets, the concrete platforms for the passengers, some dirt, bushes, trees, and grass. The Park Hotel (the white building to the left) will move up close to Osos street and a little closer to the tracks. The office will go where the floor plan is now with the depot to the right of that on that blank piece of wood, and a house to be figured out later further to the right in front of those big palm trees. Remember, clicking on the pictures will enlarge them. The passenger depot at San Luis Obispo installed. The former depot which is now an office building. Still a little bit of clean up and touch up required. The depot area with passengers and plants added.